Applications: Surface cleaning, coatings removal, surface blending and surface finishing on stainless and other metals. For use on a suitable deep-hold backing pad on hand-held metal polishers or variable speed angle grinders. 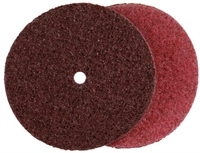 Product Notes: Surface conditioning material is a non-woven abrasive material on grip type backing. It does not easily load and is durable, especially when not used for de-burring. Choose from grade 1 (coarse), 2 (medium) or 3 (very fine), depending on whether you are clean or fine finishing. We offer 100, 115 and 125mm discs with a 10mm locating hole which fix on to a small pin on the special backing pad. This ensures correct central location of the disc and minimises vibration. Also Available: We offer suitable backing pads with locating pins to help improve balance and reduce vibration.